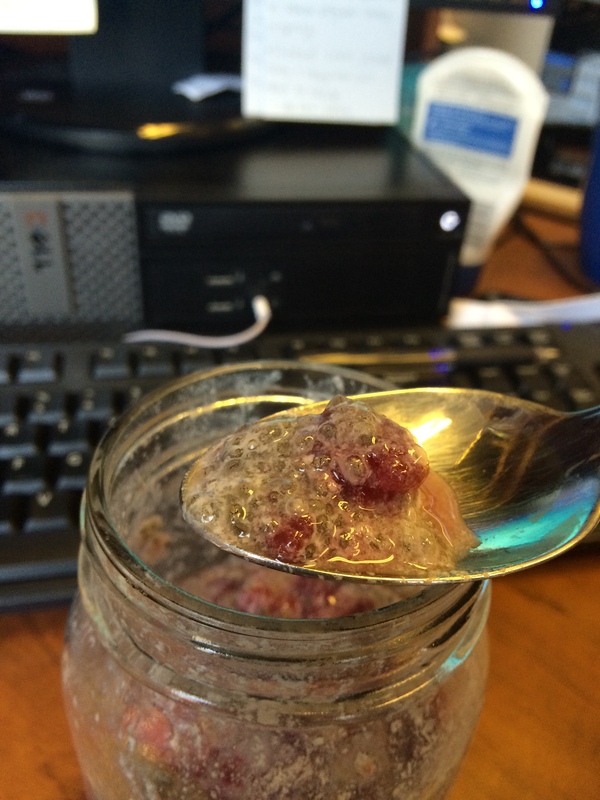 Kitchen Experiment: Raspberry Vanilla Chia Seed Pudding – The Small Things. I’ve said this before and I will say it again, me and the kitchen are not good friends. Wow that rhymed! But seriously when it comes to cooking, baking and making food, I am not in my element. But that doesn’t stop me from experimenting every now and again. Sometimes my kitchen experiments are a hit (check out my awesome protein balls, or my salad in a jar trick) annnnnnd sometimes they are a big miss (learn from my guacamole disaster). Today my kitchen experiment falls somewhere in between, it’s good but some refining is needed. So what did I attempt to make this time?! 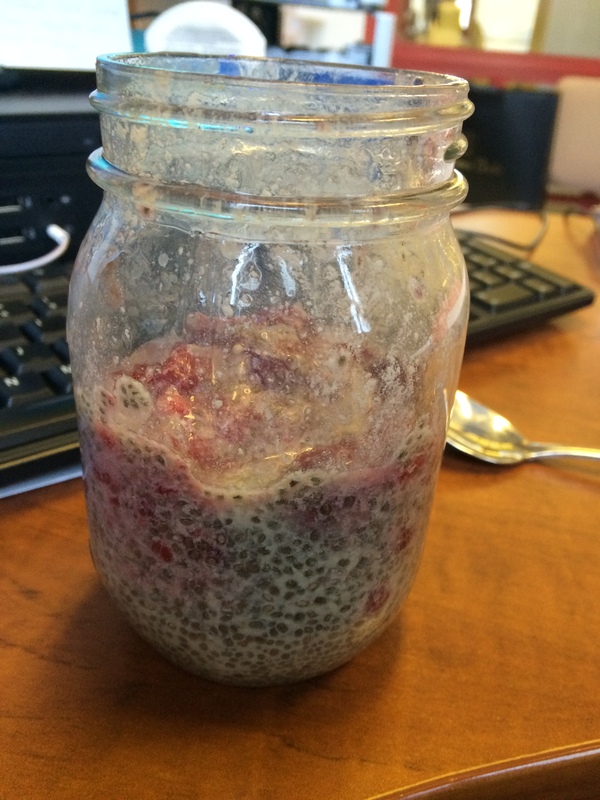 Well it’s in the title… Raspberry Vanilla Chia Seed Pudding! Please keep in mind that I am not a photographer or a food blogger and so the pictures do not do it justice. In fact the whole thing looks rather gross in the pictures. But I swear it is actually delicious! I follow a lot of fancy food bloggers (who are much more kitchen savvy than myself) and chia seeds are all the rage right now. They are rich in anti-oxidants and are super-duper nutritious, despite their tiny size. Because chia seeds are essentially flavourless you can add them to basically anything for added protein and fiber. Salads. Smoothies. Baked goods. Or you can make into a pudding! Actually, I think pudding is an inaccurate description of what this is. It sort of has a jelly consistency. So I am more inclined to call it textured jell-O. Bottom line: No matter what it is called it is healthy and pretty darn good. I’ve seen a ton of chia seed pudding recipes online but this morning I decided to wing it instead of following any one particular recipe. See the recipe below! 3. Add the frozen berries and let sit for an hour or so. I let mine sit in my bag while I was on my commute to work. This allowed for the berries to thaw out and for the seeds to create the jelly texture. But, you could also let it sit in the fridge, just be sure to leave it be for at least an hour. Note: Some people prefer to have their chia pudding sit overnight but I think that might be overkill. I think my experiment turned out pretty well! I feel full and I it tasted good. That being said I add too much vanilla. I must have added nearly a full table spoon which made the vanilla flavour very very overwhelming. I adjusted the measurement in the recipe above. I also think other frozen berries would work out quite nicely. Next time I think I’d like to add some chocolate chips to the experiment. Just for kicks! Have you ever tried chia seed pudding? How did yours turn out? Share in the comments! PS. Have you seen the google image today?! It is st. Patrick’s day themed! Adorable! I definitely recommend adding chia seeds to your diet where you can. I’ve read multiple articles about the “superfood” properties of these little guys. With my new dietary restrictions I figure why go half way when I can go all out so I’m really trying hard to add good things to my diet and remove all the bad things. It is a slow process of adding and removing though. I’m not a fan of the abrupt cold cut method. If you pick some up Google “chia seed recipes” and the Internet will provide you with so many options! Let me know what you think!